The living room offers a comfy-cozy sofa and coffee table! Whether you plan to watch “the big game”, snuggle up and read a book, or enjoy time with family and friends, you'll feel right at home! Directly off of the living there is a dining area. There is also a cozy little breakfast nook to enjoy your morning coffee. The well-appointed master bedroom will be tough to leave each morning… but we know you'll manage to find the motivation to enjoy some of that Florida sunshine somehow! The fabulous king-sized bed is not just comfortable, it is downright heavenly! Big fluffy pillows, adorable bedspread that's not too hot, not too cold, but just right. Located across off the master is an additional bedroom. The feeling of complete comfort and luxury certainly isn't lacking in this soothing-toned space either! The guest bedroom offers a queen-sized version of heaven-sent perfection, inviting and restful bedding. The third bedroom another guest bedroom offers a queen-sized version of heaven-sent perfection, inviting and restful bedding as well as a roomy closet . Experience the Emerald Coast as it should be and contact us today about our current specials and to reserve your preferred dates, spring and summer are booking fast! Everyone is welcome of course! but, the responsible party booking this reservation must be 25 years of age or older and remain present throughout the entire stay. Once upon a Tide" is a spacious two bedroom condo overlooking the idyllic town center of Carillon Beach. You will feel as if you have stepped into your own vacation fairytale once you arrive at this coveted Carillon property. Enjoy a truly magical night on the spacious balcony overlooking the twinkling lights of the town green or stroll through the picturesque walks of Carillon about 450 meters to enjoy a sunset on the beach. The open floor plan of the first floor allows easy flow between the fully equipped kitchen with new stainless appliances and the living and dining areas. 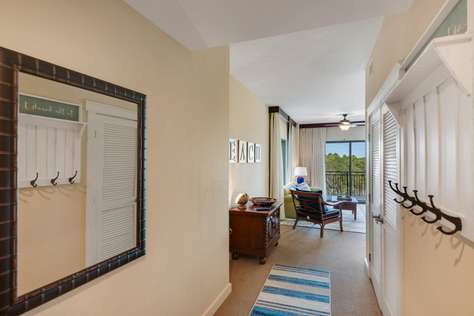 The second floor offers two bedrooms with private baths, flat screen TVs, and partial views of both the Gulf of Mexico and Lake Carillon. Find your “happily ever after” enveloped in allure of Carillon beach at Once Upon a Tide. Laketown Wharf unit 827 is an adorable two bedroom, two bath condo with an open bunk room and is a MUST STAY! Gulf views from the large and spacious living/dining/kitchen area are fabulous through the floor-to-ceiling windows leading out to the large balcony. The recently painted unit has been redecorated so you will feel at home from the moment you walk in. The master bedroom features a large king size bed with a comfortable new mattress and a large master walk in closet. The bedroom has a 40" flat screen TV and access to the large balcony on the beach side. The master bathroom features a walk in shower and separate garden tub for relaxing at the end of a long beach day. The second bedroom has a king sized bed, with a nice comfortable new mattress, and the open bunk room has twin size bunk beds. The second bathroom is in the hallway across from the bunk area, so it is easily accessible right outside the second bedroom, living room, and bunk area. The brand new stacked washer and dryer can also be found in the hallway in its own separate room. This unit has been newly painted and redecorated to offer you the best beach experience for the best value in this area. 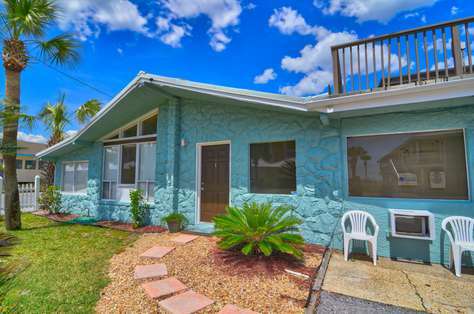 You will love the feel of this beachy condo, just across the street from the beach. The kitchen area is fully equipped with dishes and pots/pans perfect for cooking a full meal or enjoying a snack during your break from the beach. The kitchen area also has plenty of dishes, silverware, and glassware for the whole family. It includes the over the counter microwave and a dishwasher, so more time is spent with the family, You will also find a new Keurig for the late night coffee or early morning sunrises on the balcony. There is a dining room table that accommodates four and the kitchen island has 3 bar stools for the extra seating as well. The living room offers a wonderful view through the floor to ceiling windows. The living room couch is perfect for enjoying a movie with family or watch the game with friends, then after a long day it turns into a sleeper sofa for the added sleeping arrangements for the larger groups. The 55' TV is sure to gather the attention of those who enjoy it, with cable TV and free internet. Guests enjoy secure covered parking in the onsite parking garage and a covered walkway to the building, with access to several large modern elevators. The onsite restaurants offer a variety of quick snacks, including gourmet lunches, fresh salads, buffet dinners and more. The convention center also offers year round events and entertainment for guest and owners. Onsite are five pools with one being a kid pool with slides. Whether it's strolling on the beach, snorkeling, para-sailing or fishing, close by you'll find opportunities to enjoy everything there is to do in, under, above, or on the water.An onsite fitness center with state-of-the-art equipment includes a steam room and a sauna with gulf views. Laketown Wharf's amenities are second to none, boasting a bar and grill by the main pool, convention facilities, the best workout facility in town, restaurants and much more! Everyone is welcome of course! but, the responsible party booking this reservation must be 25 years of age or older and remain present throughout the entire stay. Call today to see this gem! Laketown Wharf unit 827 is an adorable two bedroom, two bath condo with an open bunk room and is a MUST STAY! Gulf views from the large and spacious living/dining/kitchen area are fabulous through the floor-to-ceiling windows leading out to the large balcony. The recently painted unit has been redecorated so you will at home from the moment you walk in. Guests enjoy secure covered parking and a covered walkway to the building, with access to four large modern elevators. The onsite restaurants offer a variety of quick snacks, including gourmet lunches, fresh salads, buffet dinners and more. The convention center also offers year round events and entertainment for guest and owners. Onsite are five pools with one being a kid pool with slides. Whether it's strolling on the beach, snorkeling, para-sailing or fishing, close by you'll find opportunities to enjoy everything there is to do in, under, above, or on the water.An onsite fitness center with state-of-the-art equipment includes a steam room and a sauna with gulf views. Laketown Wharfs' amenities are second to none, boasting a bar and grill by the main pool, convention facilities, the best workout facility in town, restaurants and much more! Everyone is welcome of course! but, the responsible party booking this reservation must be 25 years of age or older and remain present throughout the entire stay. Call today to see this gem! Laketown Wharf unit 1608 is an adorable two bedroom, two bath condo with an open bunk room and is a MUST STAY! Gulf views from the large and spacious living/dining/kitchen area are fabulous through the floor-to-ceiling windows leading out to the large balcony. The recently painted unit has been redecorated so you will at home from the moment you walk in. The master bedroom features a large king size bed and master walk in closet. The bedroom also has a flat screen TV and access to the large balcony on the beach side. The master bathroom features a walk in shower and separate garden tub for relaxing at the end of a long beach day. The second bedroom has a king sized bed and the open bunk room has twin size bunk beds. This unit has been newly painted and redecorated to offer you the best beach experience for the best value in this area. All of the mattress are new and so is all the living room furniture. You will feel right at home as soon as you walk in. The second bathroom is in the hallway across from the bunk area, so it is easily accessible right outside the second bedroom, living room, and bunk area. The brand new stacked washer and dryer can also be found in the hallway in its own separate room. The kitchen area is fully equipped with dishes and pots/pans perfect for cooking a full meal or enjoying a snack during your break from the beach. It includes the over the counter microwave and a dishwasher, so more time is spent with the family, You will also find a new Keurig for those late night coffee's or early morning sunrises on the balcony. There is a dining room table that accommodates four and the kitchen island has 3 bar stools for the extra seating as well. Guests enjoy secure covered parking and a covered walkway to the building, with access to four large modern elevators. The onsite resturaunts offer a variety of quick snacks, including gourmet lunches, fresh salads, buffett dinners and more. The convention center also offers year round events and entertainment for guest and owners. Onsite are five pools with one being a kid pool with slides. Whether it's strolling on the beach, snorkeling, para-sailing or fishing, close by you'll find opportunities to enjoy everything there is to do in, under, above, or on the water.An onsite fitness center with state-of-the-art equipment includes a steam room and a sauna with gulf views. Laketown Wharfs' amenities are second to none, boasting a bar and grill by the main pool, convention facilities, the best workout facility in town, resturaunts and much more! Everyone is welcome of course! but, the responsible party booking this reservation must be 25 years of age or older and remain present throughout the entire stay. Call today to see this gem! Laketown Wharf unit 1925 is an adorable two bedroom, two bath condo with and bunk and is a MUST STAY! Gulf views from the large and spacious living/dining/kitchen area are fabulous through the floor-to-ceiling windows leading out to the large balcony. The recently updated kitchen features new stainless steel appliances, a large breakfast bar, and plenty of storage. Bedrooms and living room boast flat screens. 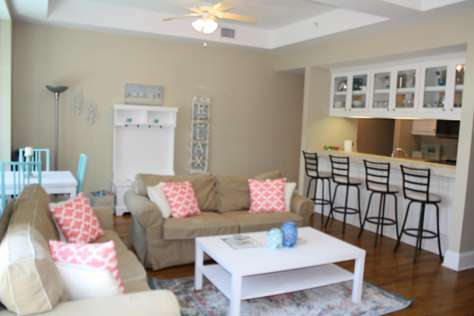 Origin 417 is an adorable one bedroom, one bath condo that is a MUST STAY! Large and spacious living/dining/kitchen area are fabulous through the floor-to-ceiling windows leading out to the large balcony. Bedrooms and living room boast new flat screens (55" in living room 42 in the bedroom). 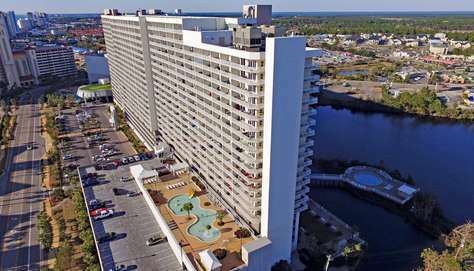 First class Panama City Beach condo amenities include the Grand Pool Terrace with views of the Gulf of Mexico, heated whirlpool, large built-in stainless steel grill for the family BBQ with and indoor/outdoor dining. Origin at Seahaven also has state-of-the-art fitness room which includes the latest aerobic equipment, stationary equipment, and free weights. You can enjoy your favorite movie at the Grand Theatre with stadium seating. Everyone is welcome of course! but, the responsible party booking this reservation must be 25 years of age or older and remain present throughout the entire stay. Call today to see this gem! This all one level, second floor, two bedroom, 2 bathroom condo has wood look tile flooring throughout all rooms. 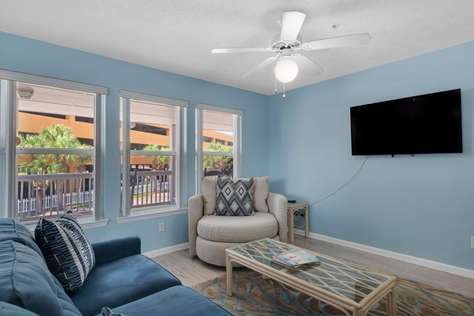 A family friendly, budget friendly condo and complex on the west end of Panama City Beach, is about 5 miles west of Pier Park. The condo has 1 queen bed in master bedroom, two twins in the second bedroom, and a sleeper sofa. Looking for your best beach vacation yet? You've found the right place! Located on the West end of Panama City Beach, you'll be part of the very exclusive club of lucky people who get to enjoy this pristine stretch of sugar-white sand beach! This 2 bedroom 2 bathroom has all the space you will need! 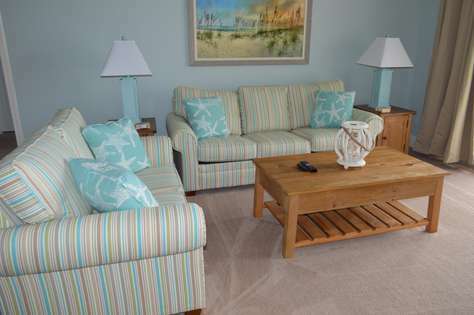 This cozy beach themed condo across from the beach, updated furnishings and all of the comforts of home. The master bedroom has a queen size bed, while the second bedroom has a bunk bed featuring a full size on the bottom and a twin on the top. This unit also has a sleeper sofa in the living room. Everyone is welcome of course! but, the responsible party booking this reservation must be 25 years of age or older and remain present throughout the entire stay. 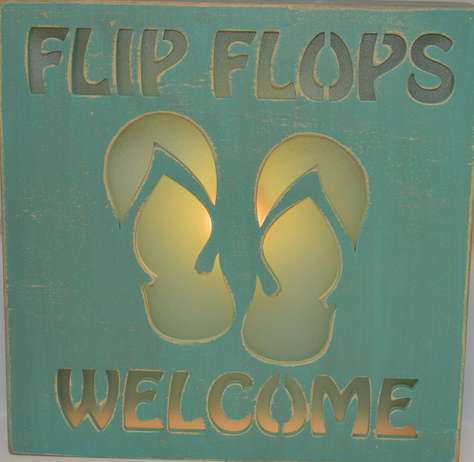 Call and book with Beachy-Cations today! Laketown Wharf unit 1609 is an adorable two bedroom, two bath condo with an open bunk room and is a MUST STAY! Gulf views from the large and spacious living/dining/kitchen area are fabulous through the floor-to-ceiling windows leading out to the large balcony. The recently painted unit has been redecorated so you will at home from the moment you walk in. The master bedroom features a large king size bed and master walk in closet. The bedroom also has a 40' flat screen TV and access to the large balcony facing the beach. The master bathroom features a walk in shower and separate garden tub for relaxing at the end of a long beach day. The second bedroom has a king sized bed and the open bunk room has twin size bunk beds. The second bathroom is in the hallway across from the bunk area, so it is easily accessible right outside the second bedroom, living room, and bunk area. This unit has been newly painted and redecorated to offer you the best beach experience for the best value in this area. All of the mattress are new and so is all the living room furniture. The living room features a large 50' flat screen TV for the whole family to enjoy from morning cartoons to all your favorite sports games. 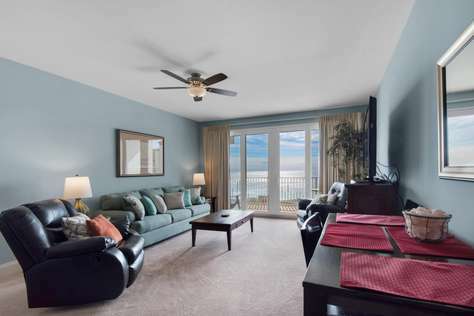 The large private balcony is also accessible from the living room, so you can walk right out to cool breeze of the gulf. You will feel right at home as soon as you walk in. The brand new stacked washer and dryer can also be found in the hallway in its own separate utility closet.